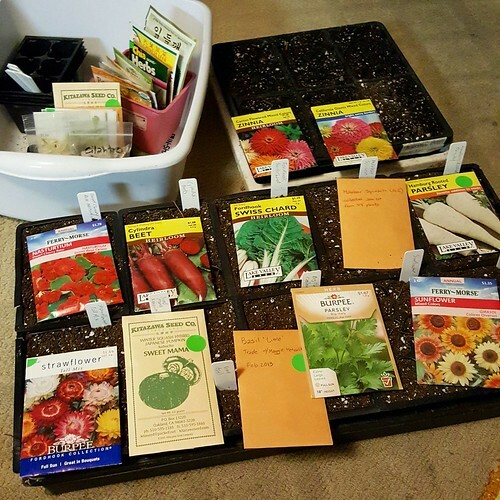 After spending Saturday day and Sunday morning at Hayward, I got home and immediately changed to work in the garden. I was planning on cutting the Fire Blight off our Pear tree, but did not get around to it. I started my placing paver bricks around our Compost Bin because something has been digging into it. I think the larger hard flat area will also be easier for my Mom to walk on. 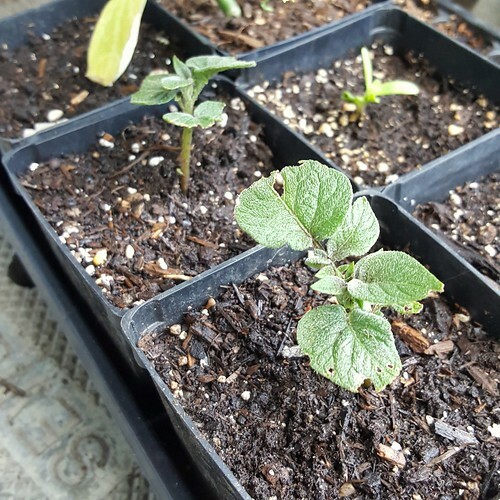 I then potted up the mixed Zinnia seedling that were growing in cell packs. I potted up ten 3 inch pots. 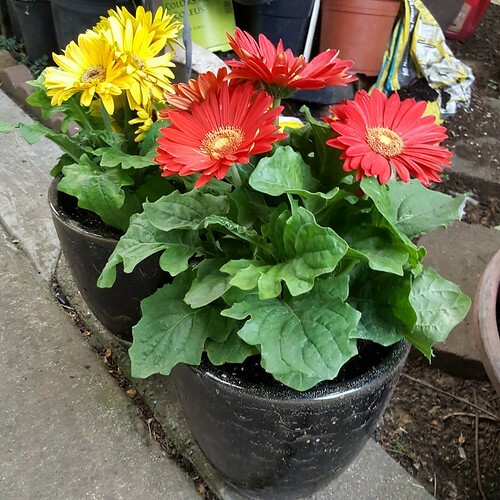 Next up was potting up two 1 gallon pots of Gerber Daisies that my brother gave my Mom for Mother’s Day. Each of those went into a ceramic pot. My next chore was to cut down the bolted Portuguese Kale in the backyard Square Foot Garden so I can amend the soil and plant some veggies for the summer. I’ll save some seeds from the 8+ foot Portuguese Kale plant and compost the rest. I didn’t finish clearing everything out since it was dark now and I was getting hungry. Monday after work, it was still some daylight left so I rushed to get some gardening done. 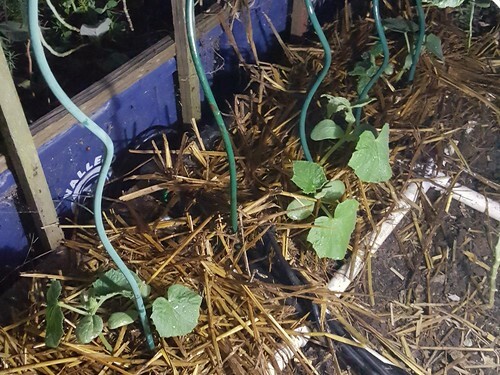 I finished cutting down and pulling the old Portuguese Kale and amended three squares with Chicken Manure so I can plant out Cucumber start, which I finished off by mulching with with aged straw. I didn’t get to amend the other cleared square, but I’ll do that later. 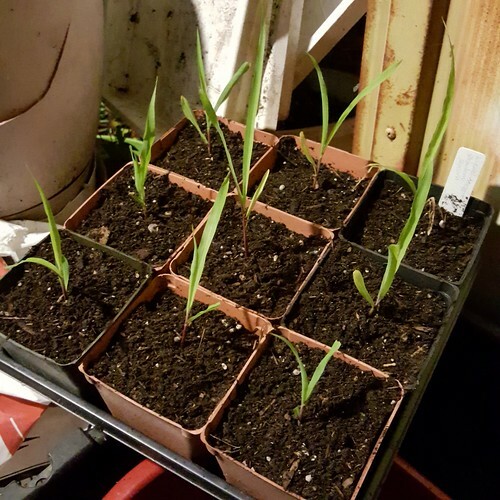 Before going in, I potted up some Strawberry Popcorn from cell packs to 3″ pots. I also potted up a few Purple Potatoes that I found in the Square Foot Garden. My Canon EOS 60D stopped working while I was on vacation in Cabo San Lucas. I think it happened when we went out one night and I was dancing with it at a nightclub. 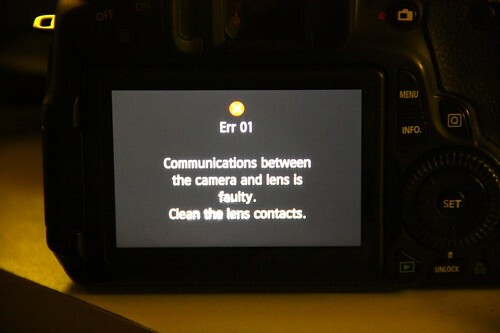 Initially, I thought the lens that was busted, but when I got home the lens worked on my Canon Rebel XSi and none of my lenses worked on the 60D… so it was the camera… Luckily, it is still under warranty, so I sent it in to Canon for repairs. Hopefully, it can be fixed without additional cost. 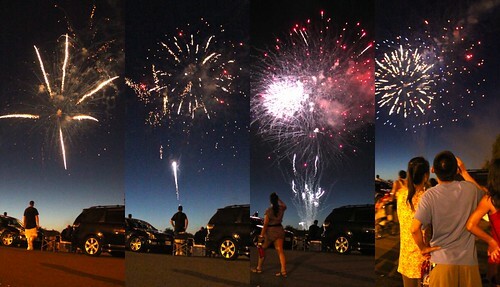 Hope you had a safe and happy 4th of July!